If you’ve received a referral for a job or new business, your online digital presence or branding is critical. You are literally only one click away from being chosen or passed up for great opportunities but many times, you’ll never know. 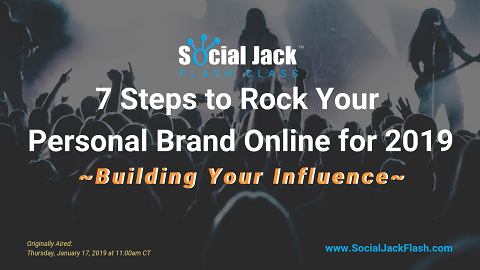 Equip yourself with the tools from the best who helped thousands of professionals elevate their personal brand and increase their Influence online. 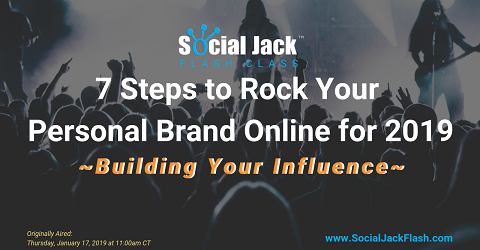 Dean DeLisle, the founder, and CEO of Social Jack™, and his team have put together a quick, easy-to-follow recipe to get you on the right track that enhances your online personal brand and builds your Influence so that YOU are chosen for better, professional opportunities. Why and how your digital presence impacts your personal brand. Easy tips to help shift your placement in searches and get found before your competitors. Specific steps to help you become known in your social and professional networks. What is a “Flash Class”? We take important actionable education and condense it to be consumed in less than 30 minutes using a webinar format. These classes are designed so when you leave, you can take the immediate next steps to accelerate your digital influence in the world.